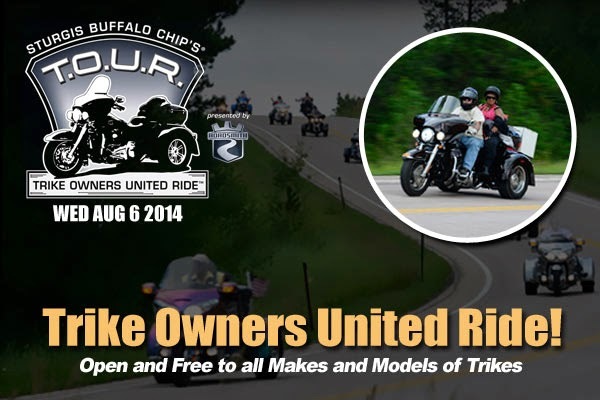 Sturgis, SD - The Sturgis Buffalo Chip announces that its Trike Owners United Ride (T.O.U.R.) will return for a second year on Wednesday, Aug. 6 during the Sturgis Rally. The annual all-trike event is sponsored by Roadsmith Trikes, and it includes a 50-mile self-guided ride through the scenic Black Hills leading to a custom trike show and private reception at the Buffalo Chip. The T.O.U.R. event is free of charge and is open to all makes and models of trikes. Riders may pre-register for the event at www.buffalochip.com/EVENTS/Signature-Events/Trike-Owners-United-Ride. The T.O.U.R. ride departs from Main Street in Hill City, SD and takes trikers on a 50-mile self-guided ride through the scenic highways of the Black Hills, including Vanocker Canyon, before concluding at the Sturgis Buffalo Chip. The ride culminates with a trike procession through the Buffalo Chip grounds that leads to a private reception at the Chip’s Russ Brown Events Center. The T.O.U.R. reception will give participants a unique opportunity to spend time socializing with hundreds of fellow trikers while enjoying free hors d’oeuvres and live entertainment. The reception will also feature door prizes, a custom trike show and full access to the Buffalo Chip’s Motorcycles as Art exhibition, curated by famed motorcycle photographer, Michael Lichter. T.O.U.R. participants who wish to take in additional Buffalo Chip events on Aug. 6, including that evening’s performance by Florida Georgia Line, may do so by purchasing campground admission passes. Passes for the Buffalo Chip’s 33rd annual Motorcycle and Music Festival are on sale now. All concerts are free with camping. For more information, to register or to get passes to the Largest Music Festival in Motorcycling™, visit www.BuffaloChip.com or call (605) 347-9000.